« Tea Trolleys clattering through Inner Temple Library? The Sack of Rome? Sacre Bleu ! I take the view, provided law bloggers stick within the rules of civil and criminal law – there are no rules about law blogging or how to blog. I marvel at the attempts of lawyers and meedja experts to categorise – but as they aren’t committing any crimes against humanity by so doing, I am quite happy for them to do so. I tend not to read these posts. If law bloggers provide good content, answer comments on their blogs or engage on twitter et al – and obtain benefit to reputation and their practice – that is fine by me. I am not a fan of websites that rely on the content of others to build their following and gain commercial benefit without paying the bloggers : Huffington Post UK (I understand that they do not currently pay bloggers for content) and NetLaw Media SolicitorsBlog (which appears to have little original content of their own and relies on ‘giving publicity to newspapers and law blogger posts’ for content, in the main – but hey… they don’t charge bloggers for the privilege… so all is good!) come to mind. It is a free market and readers must judge for themselves whether they wish to support such initiatives. These sites are free to do what they do. But some writers have to live as well and rely on their writing – so if you continue to support sites which don’t pay for content don’t be surprised if those writers go elsewhere or stop writing. I am more than happy to pay newspapers for their papers each morning and would be equally happy to pay a modest fee to access their online content as well. The Twlawyers – lawyers who simply blog and tweet to introduce their brilliance to the world – a US phenomenon gaining ‘traction’ in this country – are of little value or interest to me. They may be of value to others. I thoroughly endorse US defense lawyer Scott Greenfield’s approach to outing bad lawyers and being ruthless, with others, on ‘calling out lawyers’ who have not the got the skill or expertise to do what they promise to an unsuspecting twitterati. Some of the crazier, angrier people on the internet believe that there is a vast conspiracy afoot among lawyers and judges to cover up our failings, to conceal our wrongdoing. Sadly, these crazy, angry people are lawyers…. …Lawyers have no qualms about calling out cops, prosecutors and judges for doing what we perceive to be wrong, but they are the agreed-upon targets and there’s no risk in attacking the mutually agreed-upon perpetrators of evil. In fact, it’s damn good business, since potential clients similarly despise those whom they perceive to be the sources of their misery. It’s not bold. It’s not brave. It may well be called for, but it’s not enough. The second we shy away from saying what we believe must be said, we become the enablers and apologists for all that has gone terribly wrong with the legal profession and system. One recurring question about our system, that most of us feel has failed miserably to live up to its platitudes, is how do we fix it. While I have no magic bullet answer, there is one thing we can do in the meantime. Expose what’s wrong with the system, including the failings of our own, and face the consequences of being the most unpleasant person in the blawgosphere. There is also an astonishing film on Scott Greenfield’s blog post showing a lawyer being dealt with by a judge in the US for turning up to represent a client facing life imprisonment while drunk. Call that lawyer out? Damn right. Expose bad lawyers here…? Yes. The Legal Ombudsman has written a fascinating post about the need for barristers to change their attitude to being ‘called out’ for poor service. The Office for Judicial Complaints has just published the statistics for complaints against the judiciary. Transparency and a high quality of work is all if you are a lawyer taking money for your services. There we are… I have made my position absolutely clear. Unfollow if you wish on twitter et al. Cassio: Reputation, reputation, reputation! O! I have lost my reputation. I have lost the immortal part of myself, and what remains is bestial. My reputation, Iago, my reputation! Iago: As I am an honest man, I thought you had received some bodily wound; there is more offence in that than in reputation. Reputation is an idle and most false imposition; oft got without merit, and lost without deserving: you have lost no reputation at all, unless you repute yourself such a loser. -Shakespeare, Othello, the Moor of Venice, Act II. Scene III, 242-249. Best thing for legal blogging is to keep off the law stuff. Works a treat…. Thebungblog – one of the great pleasures of writing blogs is reading comments like yours – excellent performance! I fear we may be on the verge of the “Blawg Hole”… a dangerous phenomemon where the sheer weight of lawyers blogging about lawyers blogging about how lawyers should blog causes the “Blawgosphere” to collapse into a super-dense singularity of absolute tedium from which nothing can escape. Jon – I totally agree. Everyone should stop worrying so much, stop picking over whether there’s a right way or wrong way to do and just get the hell on with blogging and enjoy it. Otherwise… what’s the point? (Actually, don’t answer that). A couple of days ago I transcribed a tribunal judgment for discussion on t’internet. The experience was unsatisfactory for a number of reasons: the spelling errors, the inconsistent spelling of names, the document was so poor I don’t understand why the Tribunal judge signed it. So they insist upon electronic copies of documents, in a particular format, whilst posting out hard copies of judgments. I regard this as incompatible with open justice and article 10. Since the point of ordering the judgment was to discuss it on the internet, typing it out was certainly an impediment to this process. Anyway, that’s my outing of poor quality work and opacity within the judicial system. 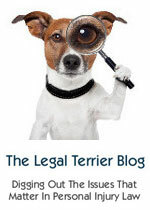 I love to read legal blogs. Especially where people say what they mean for once, rather than the media-relations drivel of business.